Do You Want To Become a More Effective Leader? 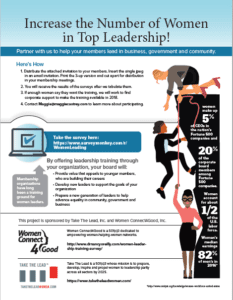 We are partnering with many organizations to obtain leadership training opportunities for women. We’d like to partner with yours, too! By completing the Leadership Interest Survey, women can ask for what they want — the first step towards becoming more effective leaders. From where we sit, our families, communities and especially our women are still getting the short end of the stick. No one is going to fix this for us, so it’s up to women to step up and make changes. Studies have shown that having more women in leadership roles makes businesses much more profitable, and employees are happier and easier to recruit and retain. Yet although the doors to the C-Suite are open, too few women are walking through to take their fair and equal share of top positions. Let’s change that! Research shows and we know from experience that women hang back because they don’t like the old oppressive model of “power over” so we need to help them embrace the expansive, inclusive “power to” that enables us to work together for positive change. Women can and will band together to support each other in advancement, to encourage each other to ask for raises and promotions, and to fight for fairness if their requests are denied. Most women do not have the benefit of a corporate professional development budget, yet our communities, businesses and nations need all women to step forward as leaders. That’s why we need women to ask for what they want: leadership training available through their membership organizations. When women raise their voices strongly to ask for this training opportunity, we will seek national grants to make such training available to large numbers of women. With more than 20 Take The Lead Leadership Ambassadors ready to conduct training sessions across the country, we can make a big change in a hurry. Complete your 5-minute survey now and ask for the training that will help you become a more effective leader. Do you think your group might be interested in participating in our survey? If so, email Maggie from our contact page. She will send you a flyer like this with information for your Board of Directors. 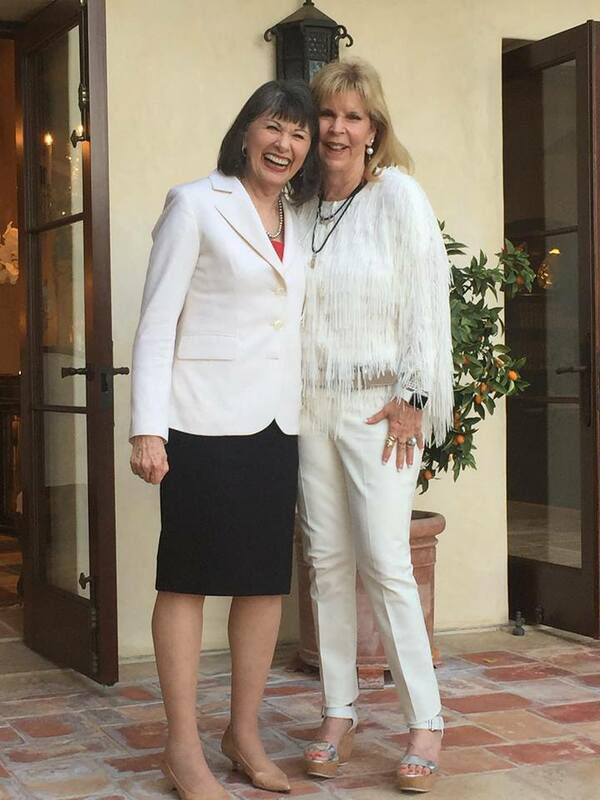 Dr. Nancy O’Reilly and Women Connect4Good have long been major supporters of Gloria Feldt and Take The Lead because we share their mission of advancing women to leadership parity by 2025. Gloria has done several podcast interviews with Dr. Nancy and authored the first essay in our book Leading Women: 20 Influential Women Share Their Secrets to Leadership, Business and Life. We supported Take The Lead’s international livestream roll-out event in 2013, underwrote training for Leadership Ambassadors, supported 9 Leadership Power Tools training for groups, and have provided major funding for operations. In addition, we have provided seed money for a 50 Women Can Change the World program [in development] in Los Angeles for women in media and entertainment. Take The Lead, Inc. is an awesome organization and we urge you to connect with them for information, training and inspiration. Learn more about Take The Lead. Women Connect4Good, Inc. is a 501(c)3 dedicated to empowering women-helping-women networks. 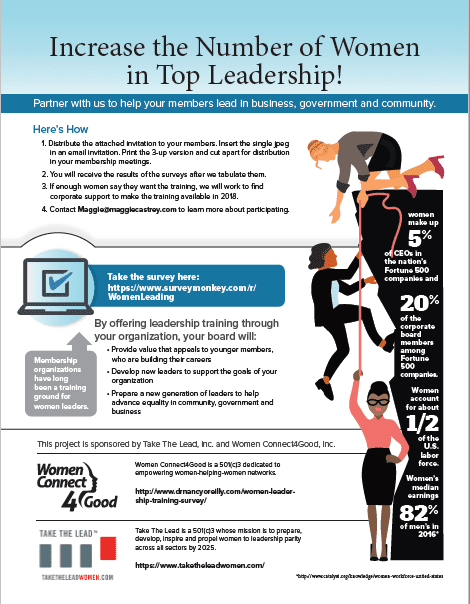 Take The Lead is a 501(c)3 whose mission is to prepare, develop, inspire and propel women to leadership parity across all sectors by 2025.